The Trillion Dollar Student Loan Crisis continues to grow, causing political and personal strife across the country. The student debt crisis passed a major milestone reaching 1 trillion dollars in 2012 according to the WSJ and New York Federal Reserve. But what does 1 trillion dollars in student debt mean for you? Is it a new sub-prime equivalent bubble or is it just a reflection of the need for people to be more educated in today’s economy? By most estimates, 1 in 5 American households are now living with student debt. The Chronicle of Higher Education puts the percentage of new students who attend college at approximately 20 million per year, and of those about 12 million take out student loans of some sort to help cover the cost. In 1989 the average debt a college student held was $9,634, by 2012 it came to $26,682, and the most recent numbers are expected to be even more staggering. Student debt actually surpassed credit-card debt in 2012, with an average of 5% of household income going towards educational expenses. That’s a lot of money consumers aren’t able to spend elsewhere. There’s really no easy answer to the student loan problem, someone at some point has to foot the bill. The government is obviously aware of the problem and has several programs to attempt to address the problem through student loan forgiveness programs. However, these programs may not be enough. U.S. Rep. Hansen Clarke (D-Mich.) has proposed a bill called the Student Loan Forgiveness Act of 2012, which would forgive student loan debt for students who’ve paid at least 10% of their discretionary income towards their loans for at least 10 years, with some stipulations. As currently proposed, it would have a cap of $45,520 of forgiveness on the principals, fees and accrued interest for loans taken on or after the date of enactment, while there would be no cap for loans which predate the enactment. Supporters say that it would inject much needed consumer funds back into the economy and free thousands of indebted students and graduates from crushing debt. 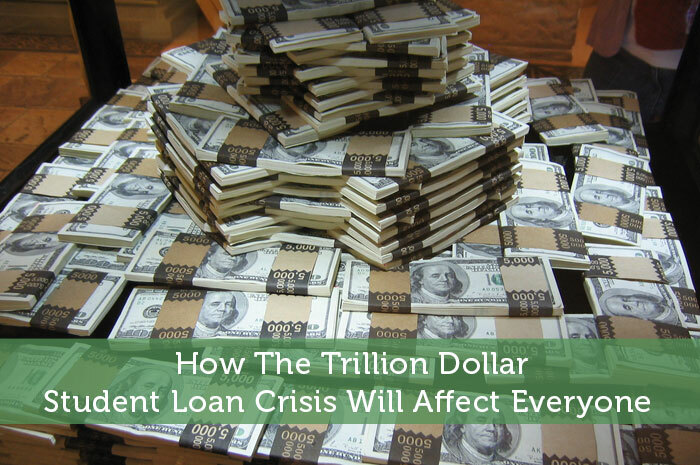 Opponents to the bill estimate that it would cost the government over one trillion dollars, increasing exponentially as student loan amounts continue to accrue, which would need to be taken from other programs. Also, some believe that not all college students have or will put their education to good use, which would further reward and encourage irresponsible fiscal behavior. Still, not sending the children of our country to college simply to avoid the debt doesn’t seem like a good idea, either. Higher education fills in the many gaps that exist from previous schooling, expands a student’s knowledge base extensively with both curriculum and experiences, and in many cases can be the definitive point between a future where the student willingly embarks on a chosen life-long career path or just settles for finding a good enough job to eke by. How Did We Get To 1 Trillion Dollars? In 1944, when the GI Bill of Rights first gave returning WWII veterans $500 towards college, Americans realized education has the power to improve quality of life. In 1959, Congress enacted the National Defense Education Act (NDEA) which gave the first federal loans to students in specialized fields of study, and ensured that America has the ability to produce highly educated students to compete in the world. In 1965, President Johnson signed into effect the Federal Family Education Loan (FFEL) which, although the program eventually became corrupted by favoritism between banks and educational institutions and was eliminated in 2010 by President Obama, allowed a much wider array of Americans access to federally-funded student loans. All federal loans today are given through the Federal Direct Lending Program (FDLP) of 1993, which continues to assist an enormous number of Americans with paying for post-secondary education. That’s definitely a lot of student loans. Hopefully there won’t be a student loan bubble. Michelle, I think there is definitely a student loan “bubble” now and its just a matter of whether it can be deflated before it pops. I am interested to see when this bubble pops. Higher education tuition rates are becoming just flat out ridiculous. Only people with money can afford it and they still need help with loans. We need to find a solution soon before higher education is no longer attainable. I definitely agree Grayson, there are too many people going to college for degrees they will never use driving up the cost of tuition. Wow. Although I’ve looked at and considered some of these stats on student loan debt, I’ve never seen it put together quite like this. Thanks for it. In other words, there’s no doubt that I made a significantly larger income as a direct result of getting my degree(s). That said, there’s almost no way I would go back to school right now without an extrememly compelling reason. When I got my master’s degree, I was sent fulltime by my employer w/ all expenses paid and my full salary. It’s a privelege I competed for and won, but if this wasn’t the condition… no way would I have gone. I have two daughters. If this condition doesn’t change dramatically, I will NOT be recommending college education unless they have hustled themselves into a significant amount of savings to pay for it. What’s really different these days is that almost all of my peers with kids feels compelled to pay for college. I understand it because of the huge expense, but I never even considered asking my parents for help through college — yet another indicator that we’re in new territory. Children’s college expense is something that weighs heavily on parents’ minds these days. What’s different is I am very focused on teaching my kids to hustle and to save. I would prefer that they never get a “job” in their lifetimes. I would prefer that they’ve learned the art of making money at an early age so that they don’t have this type of worry. However, it is very unlikely that I will be helping them through college even though I have more than enough resources to “help” them. Something that I appreciate about my parents is that the DIDN’T help me. They respected that I wanted to achieve something, and it’s very important to me. The debt isn’t necessary, really. There are literally thousands of ways to make money if you learn it. What we’re suffering from right now in the US is the lack of hustle. I believe this strongly. Anyway… blah, blah, blah. Great post, and obviously it’s got me thinking. Patrick I think you bring a thoughtful approach to the difference in the problems students face today vs 16 years ago. Too many people simply brush off the problem and say something along the lines “I paid for my education ____ years ago, kids today are just lazy” so I appreciate your comments. Best of luck teaching your daughters to hustle! I am hoping to do the same with my boy. Wow! $26000 is the average debt now? I can’t believe it! There’s got to be a point where we say the schools are too expensive and also more individual responsibility required in picking schools. I agree that a college degree has huge benefits, but if someone isn’t responsible then perhaps they should forgo college since they’ll drag themselves into debt for a long time. I disagree with forgiving student loans if the government is going to pay it. That really means that WE have to pay it and our taxes are already threatening to go up. I prefer individual responsibility and consequences. A solution to the debt problem that doesnt include personal responsibility would be completely unfair. A piece of the problem is the immediacy of the responsibility for so many students who get degrees that wont pay off but the concept of taking on debt that they wont have to pay back for years doesn’t become “real” to people for too long. Last week, I read that companies are becoming more selective about who they are hiring. And, they are looking to hire people with a college degree. However, with the rising costs of education, it becomes harder and harder to pay for college without a student loan. So, as you can see, we are stuck in a Catch 22. What I suggest is to start a 529 plan early, from the time your kid is born. You do not have to put in a fortune, just enough so that it can help pay for at least half of the tuition. Then, you can loan the rest of the amount needed for college. Another thing, it would be nice if you can have your kids work for their college education. This way, they would think twice about cutting classes because this is what they have worked for as well. Good ideas Ted. When I have kids I intend to do something like this, but probably not tell them about it early on so that they still apply for scholarships and carefully choose their post secondary education. When parents are footing the bill, there isn’t the same level of appreciation of the important of doing well. For me it seems like there`s been some kind of inflation of education. before, getting a high school diploma was all you needed, then there was a bachelor degree, and now many people find themselves in need of a MA in order to get a decent job. Wow that’s awesome that Norway has very low priced higher education. No wonder they get rated among the best places in the world to live. More countries need to adopt a system like that, but I guess it’s pretty tough to switch over once schools get established as companies. And yeah there is an increasing demand for higher education these days. “Higher education fills in the many gaps that exist from previous schooling.” I think that this problem should probably be addressed first. Personally, I think that somebody who needs to take a remedial reading class has no business being in college. It is a mistake to try to make college a catchall. Doing so only makes the cost of education higher. Instead, education needs to be fixed at lower levels first before anything more than a band-aid can be applied at higher levels. Yes people should have to know how to read during lower level education, but I don’t think we should expect lower level education to be able to teach everything that people need. High school is really just a broad education at a very basic level intended to expose you to areas that you might want to later focus on. Good point Nick. A lot of those student loans will go to people who will later drop out or won’t use their degree. I think student loans shouldn’t be given out so easily. Going to college just to go to college without any idea of what you want to do while racking up loans is crazy. So many people are in that situation though. During our younger years we are just not properly exposed to enough careers to really know what career path to choose. To get into the right college programs we often have to decide half way through high school just so that we are taking the right courses to qualify. I don’t know how people can really decide at that age. Excellent article. The amount of money it costs to go to college is insane. And the value of a degree is dropping even as the cost goes ever higher. It astounds me that universities get away with turning our children in to indentured servants. I don’t understand how college prices have gone up so much. The only explanation I can come up with is greed. When they see enrollment levels staying steady despite higher and higher costs, I guess they think that can just keep increasing the costs. Those colleges don’t seem to stop and think about how those rising costs will affect students. Great information. I didn’t realize student loans could reach this much amount. Hope the government will do something about this. I just don’t see what they can do. They’ll probably get a big chunk of that money eventually, but in the meantime they’ll just keep handing our more money. Just like the national debt, the amount will just keep growing. What percentage of this trillion won’t get paid off? I suppose it’s fine as long as we can pay it off faster than the accumulation but restricting the admittance figures. I would think a pretty big chunk would get paid off. So that part isn’t too much of a problem. The real problem is the chunk that people have problems paying back. I don’t think it would be much better for them to be rejecting more applicants and not giving them a chance. Most likely the situation will just keep going. Like all economics, look at supply and demand. Federal student loans create an artificially large supply of money to pay for college. Schools can raise their prices (which they are doing at more than 2x inflation rates) and know kids will have money available, and not take the time to understand what a hole they are getting into. After all, everyone “has to go to college”. Because the loans are from the government, nobody really worries about the ability of graduates (and those who don’t even graduate) to pay them back. Remove federal student loans (supply), and tuition (price) will have to come down to levels students can afford, or colleges will go out of business. Yes, there will be a few tough years of readjustment. But would we be better doing more of the same? Right now it’s fairly easy to rack up $50,000 or more in guaranteed loans that might get you a job in a career field that will never earn you enough to pay the loan back. No sane business or bank would give these loans, but the government (which is really all of us) persists in doing so, inadvertently exacerbating the very problem it set out to alleviate. Wait, is he saying student loans are the real problem? YES! That logic sounds fair enough, until you stop to consider the fate of the kids who would get their loans rejected as a result of student loan cutbacks. Limiting student loans and restricting people’s education would probably lead to more under-educated young adults. A large percentage of them would end up needing social assistance that would never be paid back. At least with student loans there is a good chance that the money will be recovered both by paying back the loans and by paying higher taxes. There’s no reason people can’t work their way through college with no financial assistance from anyone, parents included. It’ll take longer but what matters is getting a degree in a field for which there is a demand and that will pay reasonably well. It’s a huge mistake to major in art or the humanities and expect there to be a demand. I totally agree with you…its quite possible to work your way through college…countless people have done it and graduated debt-free. On choosing a major, that is debatable, I believe there are people who have gone the arts & humanities route and are doing alright financially. I think its more a matter of knowing ourselves, what we want with life and in what direction we are going.